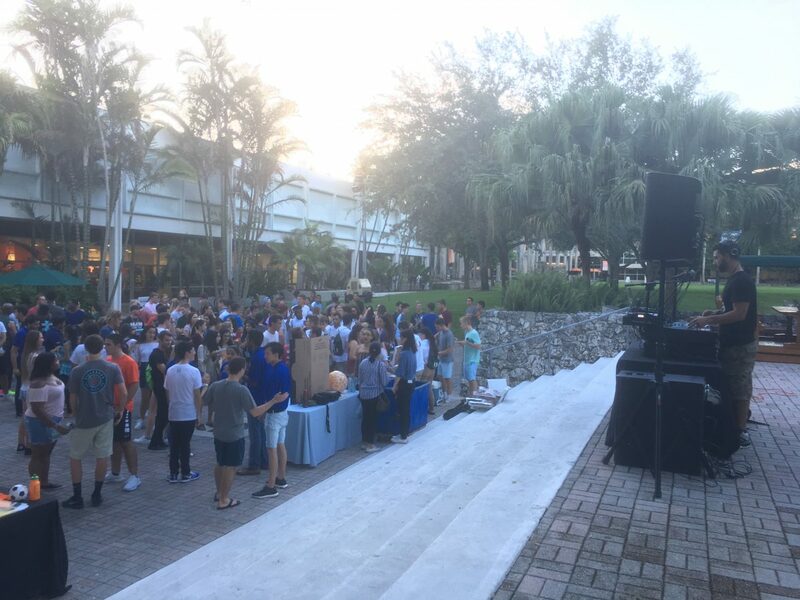 Just hours after students and their families were bustling through residential colleges with bins full of belongings, the Council of International Students and Organizations (COISO) held a welcome party aimed particularly at helping new international students transition into University of Miami. Orientation week at UM is intended to provide new ‘Canes with opportunities to assimilate to campus life. However, for new international students, the week is not just about adjusting to a new campus but to a new country. Zhizhou Ren, an incoming freshman from Beijing, China, calls UM “his dream school.” However, that doesn’t mean his first couple of days have been easy. He said one of the hardest parts so far has been adjusting to a foreign environment. For COISO Treasurer Nimesh Nagaruru, the welcome event held at the Rock encouraged students, such as Ren, to get involved and feel at home on campus. “They are a significant part of the population. They’re a part of the diversity that is Miami. By them contributing or getting themselves involved with an organization like COISO, they’re making sure that a part of them becomes a part of the UM family,” Nagaruru said. According to the 2016-2017 UM Fact Book, international students account for 14 percent of the school’s population. Daryl Teo, COISO’s vice president, said he remembers the challenges being a new international student at UM brought. Though Teo, originally from Singapore, spent his first two years of college in California, assimilating into American culture wasn’t easy. He said, similarly to Ren, he experienced culture shock. “Coming from Singapore, our culture is completely different. It’s more conservative I would say even in terms of education. It’s pretty narrow-minded, and over here you get to do anything you want to that you have a passion in,” said Teo, an economics major. As COISO’s vice president, he said he hoped the welcome party would help other international students realize they are not alone. Throughout the two-hour event hundreds of students packed into large circles mingling and dancing to Miami club favorites including “Despacito” and “Wobble Baby.” Students huddled around each other challenging one another to dance battles. It was during this time that Yi Chng, a transfer junior from the U.K., felt more comfortable transitioning to her new home. “A group of people that you don’t know, you’ve never seen before and you’ve never interacted with is scary but even if you haven’t done any verbal contact and you dance with them you feel like ‘hey this is a safer place,’” she said. Teo, now a senior, said he hopes international students don’t get discouraged from difficulties and challenges to come. “Just take it step by step. You will learn from your mistakes and develop as a person,” he said. Correction, Aug. 17, 2017, 4:09 p.m.: A previous version of this story misspelled Nimesh Nagaruru’s first name. The article has been updated with the correct name.